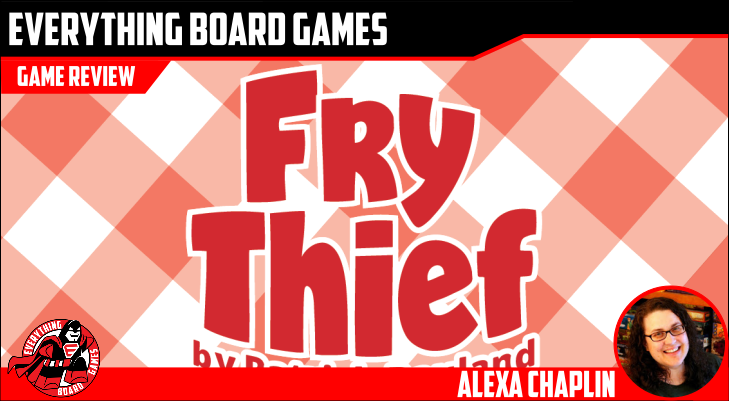 Fry Thief is a game about poor life choices. Like that time you tried to eat healthy and ordered a salad and your friend ordered a burger and fries. In Fry Thief you fight over the fries. 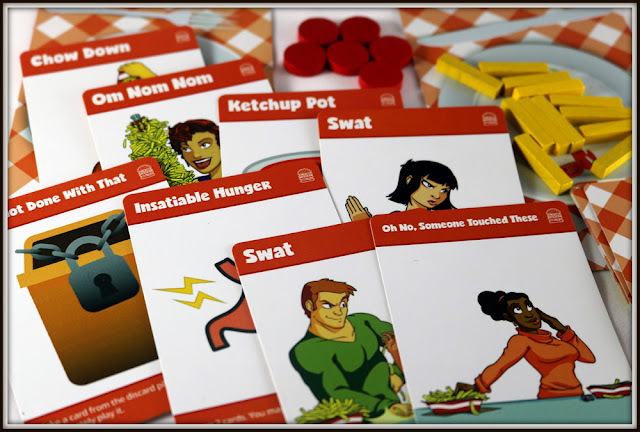 As the salad player you're trying to play cards that let you steal fries and as the burger & fries player you're trying to wolf down as many fries as possible so they can't be stolen. On your turn you play one card to try to steal or eat fries. At the end of your turn you draw a card. There are lots of combos like "Distraction" & "Look Over There" that let you steal a ton of fries if you play cards in the right order. There's also a lot of deck & hand manipulation cards like "I'm Not Done With That" which lets you pull a card out of the discard pile or "Insatiable Hunger" which lets you draw extra cards and play one immediately. When the shared deck runs out you shuffle the discard pile and create a new deck. You play until all the fries have been eaten and then count up victory points. 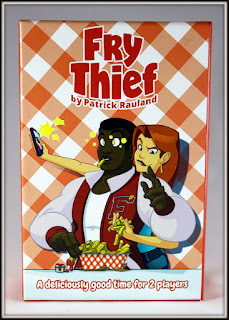 This copy of Fry Thief was provided to me by the publisher for the purposes of this review, but all opinions are my own. WARNING: This is a preview of Fry Thief, provided by the publisher through GameCrafter. All components and rules are prototype and subject to change; the game is heading to Kickstarter soon. Back in my high school cafeteria, the thing to do was shout, "Dead fish!" and point at the ceiling, or over your friend's shoulder...and when his attention was diverted, snag a couple of fries from his plate! 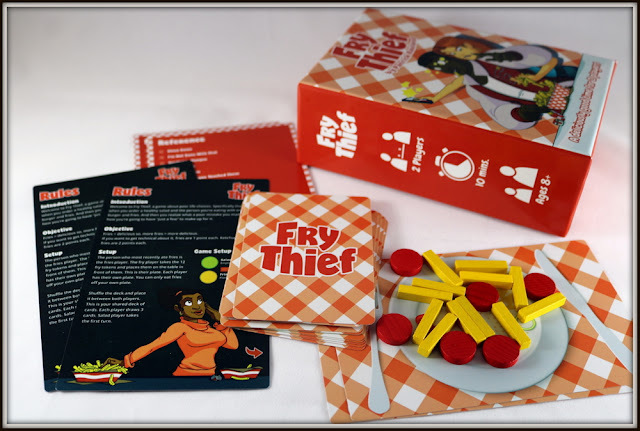 Relive the best days of sneaking fries from the other plates on the table with Fry Thief, a 16-card microgame for two players that plays in about 10 minutes. 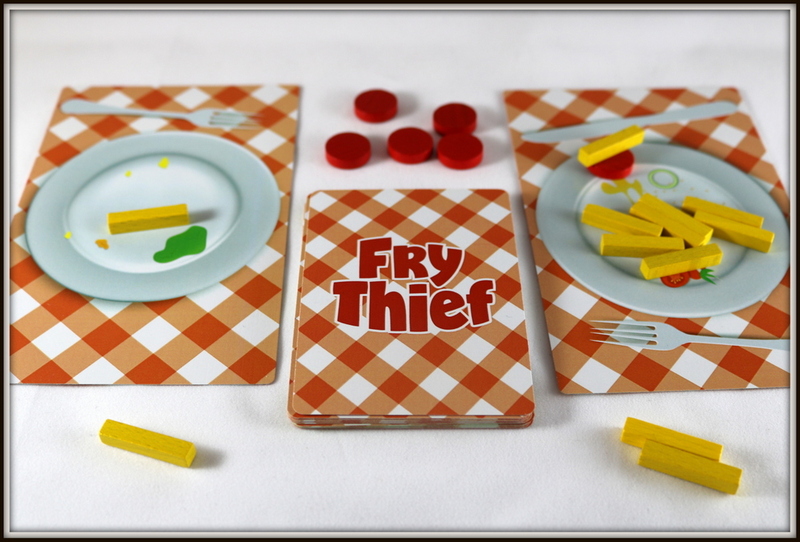 Since Fry Thief is a microgame, there's not too much to set up! Each player has a plate card, a player aid/rules card, and a summary card explaining the different cards in the game. Shuffle the deck of 15 action cards and deal 3 to each player. Now choose who will order fries (and start with all 12 wooden fry pieces on their plate) and who makes the bad choice of ordering a salad (and will start with an empty plate). Set the ketchup tokens off to the side, and get munching. Fry Thief is quick to learn and teach. On your turn, draw a card, then play a card and do what it says. You can steal fries from your opponent's plate or eat fries from your own. Fries that you eat get set off to the side and will score you 1 point each at the end of the game. Eat the most fries (and ketchup) and you win! The interesting mechanic here is that although half of the cards have red borders and work the same way no matter which player uses them, the other half of the cards are split: green on one half, and yellow on the other. 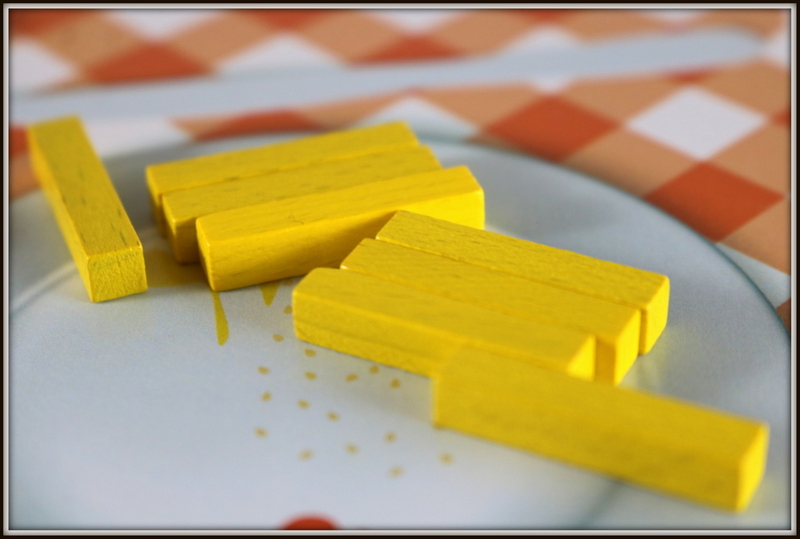 The salad-ordering player can only use the green actions, and the player who started out with all the fries can only use the yellow actions. 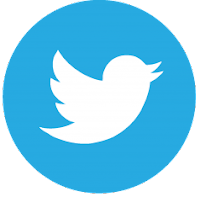 This adds more strategy and replayability into a tiny deck of cards. Some cards let you steal fries and move them to your own plate; other cards let you dip fries in ketchup or draw more cards. You just keep taking turns until all the fries have been eaten, and the player who ate the greatest total of fries and ketchup tokens is the winner and greasy champion! The graphic art is eye-catching and amusing, the backs of the cards are an adorable picnic-style gingham, and the tokens are wooden instead of cardboard. 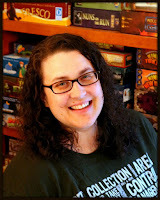 For a GameCrafter produced prototype, there's a very high level of production value here. 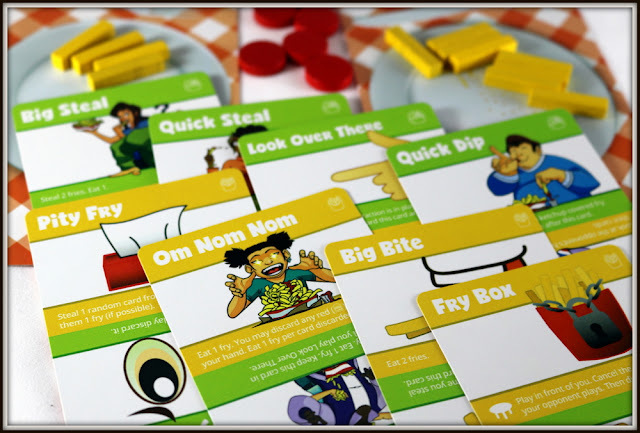 Fry Thief is quick, intuitive, and easy to learn and teach. It makes a great filler game, say, for when you're at a restaurant waiting for your actual fries and salad to arrive. The theme is quirky but oh-so-relatable and has brought a smile to the face of everyone I've played with. My only quibble is that the current box is really much too big for the amount of materials inside it and that's a problem because it makes the game harder to stick in my purse or bag when we're going out. If the box were half as deep, the tokens and cards could all still fit and I could slide it into my backpack much more easily. 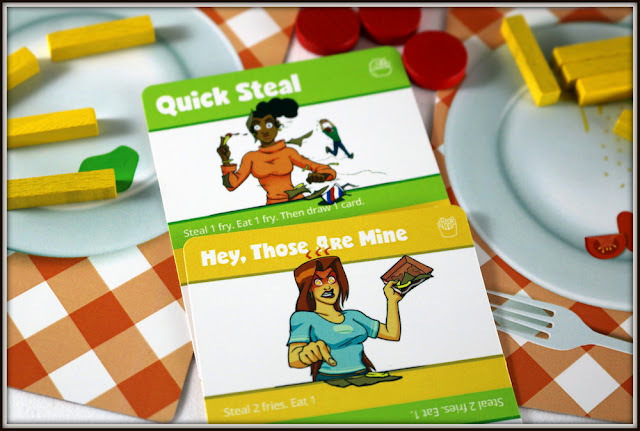 The designer has posted that this two-player, back-and-forth microgame was inspired by Love Letter, so it's clear that fans of that game and other microgames like Rumplestiltskin or Ahead in the Clouds will enjoy this one...not to mention anyone who just can't get enough salty goodness and just wants more fries. Fry Thief will steal your heart, and your fries! The theme is charming, the art is eye-catching, the mechanics are simple to learn but still layered and replayable. 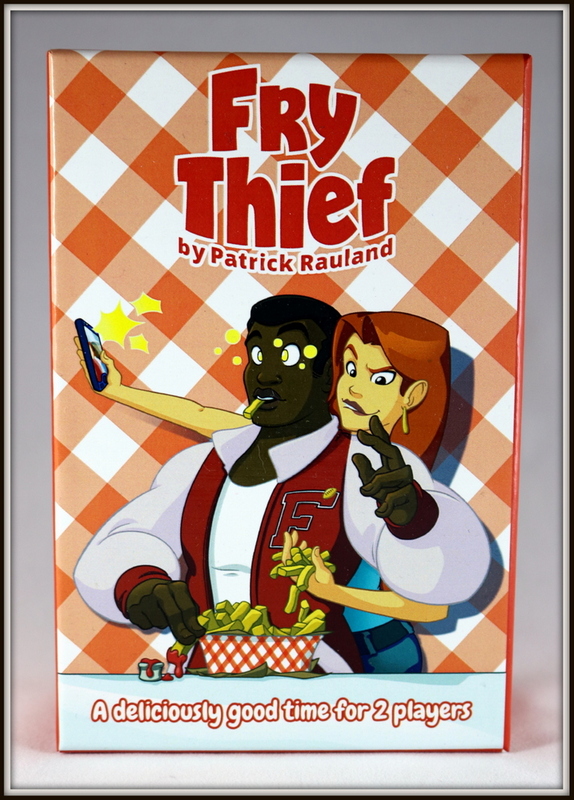 Every day is fry day now that Fry Thief has taken a spot on our small-games shelf. On KICKSTARTER now, campaign ends February 25, 2019.